I think that our students should only take the ELA, Math, SS and Science state benchmarks only if we already know how well they will do and only if we have helped them become better in those standards throughout the year. As educators, we want to know how our students are progressing on the state standards through out the year. We will measure their progress on a regular basis using the state-rubrics. We will record that data in a spreadsheet or grading program that allows us to see the students’ growth. At any given moment, we can identify what each student does well in and what areas students need to improve in. Then the state benchmarks simply verify what we already know about our students. We know that we have helped the students grow in the standards through out the year through the many classroom standards -based assessments that we have given them. Let’s get rid of last minute test prep and build standards-based learning into our curriculum. If we do benchmark type classroom activities through out the year, record, and analyze the data with technology, then we know how well the students are doing at any moment. I think that most teachers use technology for summative (final) assessments such as putting test grades into a grading program. The technology serves as an archiving system and then a calculating the grade for the 10 weeks or semester sytem. Why don’t we use technology for formative (growth) assessments such as giving a sample benchmark exam, analyzing it using a spreadsheet, working on the parts with the lowest score, and retesting to see student growth? Or to constantly monitor students’ progress through a complex task such as essay writing. If we assess each essay using the state writing rubric and record those scores in a spreadsheet, we can monitor the growth of our students in each aspect of their writing. After asking the attendees at several presentations, I would guess that technology is used for summative about 95% of the time and for formative about 5% of the time. 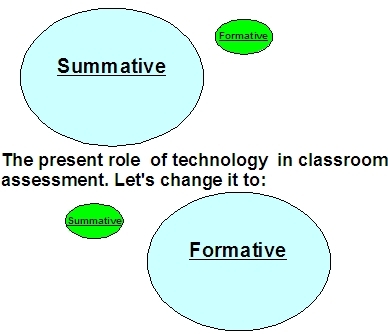 Is your use of technology formative or summative? If it is summative, how you can change it to be formative so that you can measure student growth on a standard over time? Students’ learning community -local or globally supported education? How big is your students’ learning community for your class? What is the highest number that represent with whom your students have collaborated (sent and received information)? What was the project? With whom do your students collaborate? Where are these people located? Do you offer your students a global education or a local one? Are they educated from peer-to-peer collaborations with people from different locations and cultures? Are they educated from experts from other countries? Do your students learn about a country from people within that country? Do your students compare global warming with people around the world? Do your students write about a common theme and have peer-feedback from students from other locations? Widen the community and increase your students’ learning! Students need to develop the life long skill of reflection. They have to be able to determine what they did well and what improvements they can make to improve in the future. Unfortunately, most of school is built on external feedback, usually the teacher’s. Teachers can build in the reflection process: by modeling it; by asking students to do it; and giving feedback on how insightful their reflections are. Reflections are a critical part of student electronic portfolios or eportfolios. Let’s look at a student eportfolio reflection. Nothing in the previous paragraph is a reflection. The student has summarized what he/she had to do. The only statement that comes close to a reflection is “I think I did a good job.” but even then, the student does not explain why he/she thinks he/she did a good job. Notice how the second student clearly reflects his/her thinking and contains a specific suggestion for future improvements. When your students do technology projects or eportfolios, do your students summarize or reflect? A very useful form for helping to plan any learning activity in schools is Grant and Wiggins Understanding by Design. Here is a slight modification of it for use in planning technology-infused or technology integration projects. – What enduring understandings are desired? – What essential questions will guide this project and focus teaching/learning? – What key knowledge and skills will students acquire as a result of this unit? – What prior learning, interests, misconceptions, and conceptual difficulties might students bring to this lesson? – What evidence will show that students understand the expected learning? – What will be the performance task? – Will a state rubric be used to assessed the evidence? 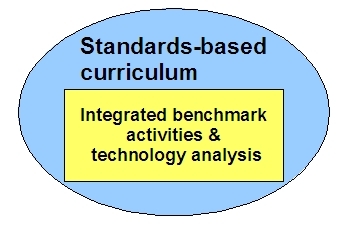 – And what other a teacher made standards-based assessment will be used? – How often will students be assessed during the project? – What sequence of teaching and learning experiences will enable the students to develop and demonstrate the desired understandings? – What technology and other resources will be used? If you have a UBD format lesson plan that you use for planning technology-infused learning, please share it. As we help teachers to plan using this model, we help them to plan for worthwhile instruction achieved through technology. I think that many students and most faculty seem learning as disconnected subjects. 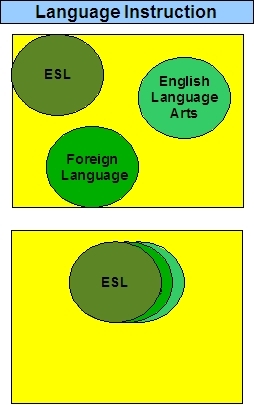 One example is Foreign Language, English as Second Language, and English Language Arts. These three areas share many more commonalities than differences. They all develop skills in listening, speaking, reading, and writing. They all have students communicate basic information, express personal ideas, criticially analyze material, and use social interactions in many different situations. I would like to see online sites where these three areas share their wonderful ideas about teaching and learning so that they can help each other. For example, students need to develop speaking skills in all three subjects so a Foreign Language teacher’s PowerPoint of transportation digital images can be used in the other two subjects. The teachers can pool their technology and print resources. The more we as teachers see the similarities in our subjects, the more we can help each other. The less time we can spend in finding, modifying or creating technology-rich resources, the more time we can spend in planning better lessons that will help our students learn more in-depth and in assessing our students’ growth. 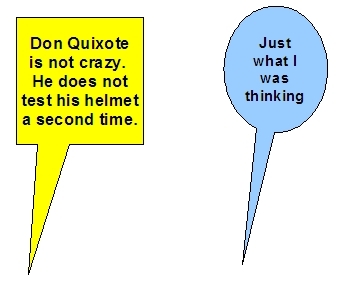 I believe that almost all online and class discussions are not assessments. Why? – Teachers do not generally assess each student. -Teachers do not generally assess a student against a content rubric or a specific standard. -Teachers do not give specific content feedback to each student. Therefore students do not grow academically. -Teachers count how many responses a student makes. -Teachers respond to a student’s emotion or lenth of statement. I do not think that most teachers teach discussion skills.